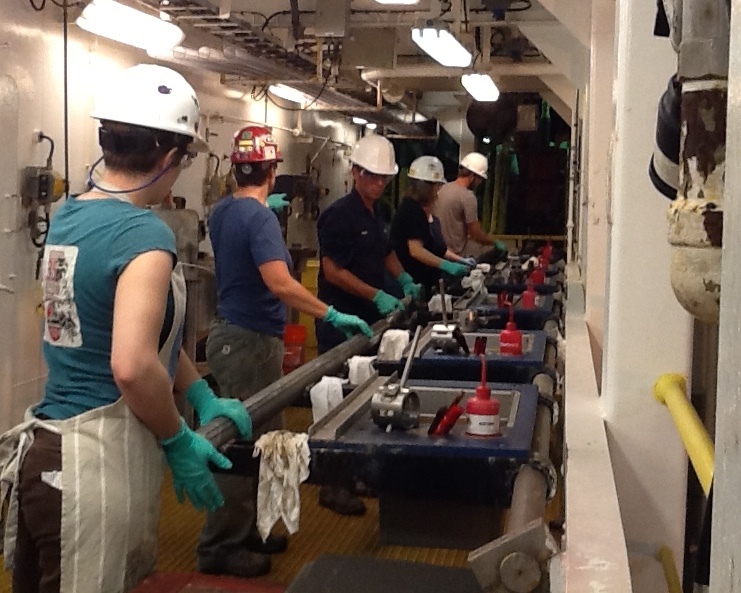 We got our first core on deck this morning at 2am ship time! It was a slurry of dark grey, muddy and sandy sediment that glistened under the catwalk lights. Everyone on shift came to crowd around–at a safe distance, wearing hard hats and safety glasses, of course–and see the first glimpse of what we’re after. The second core is already on its way through tests for properties like mineral magnetism, how fast seismic waves travel through the core, density, and chemistry. The paleontologists have taken their samples and are trying to figure out what tiny organisms are preserved in the sediment. This can tell us how old the sediments are. More on biostratigraphy in a future post! Here is a video that shows what happens to core from when it comes up out of the seafloor to when it gets laid out on lab description tables. This was made on a previous expedition, but the general “core flow” process is almost exactly the same.